I travelled with 2 female friends. It was our first time in Tunisia and I can say with some certainty our last. We arrived at our hotel about 12.30 am, tired, thirsty and hungry after travelling all day. The reception staff were not very helpful or welcoming. They informed us that we would have to wait till the morning to get a drink or a snack. The room was small and the mini bar empty. We could not even purchase a bottle of water. The next morning we had coffee delivered to our room, which we was charged for. We thought all inclusive, meant all inclusive. Breakfast was disappointing too. Our rep from Jumbo tours did not arrive. We managed to move to a bigger, better room, which helped somewhat. We had no induction to the hotel till day three, when the manager actually sat us down and explained everything. The hotel itself was quite clean, some .of the staff more friendly and helpful than others. We were the only English in the hotel and the first English in 3 years. At times this felt quite isolating. The animation team, especially Zo and Mahood the waiter were helpful and friendly, they made our stay bearable. The water aerobics and archery classes were fun and relaxing. I would advise against any women travelling here, without a husband or partner! Although in the confines of the hotel it is safe, outside is another story. The men can be letchy and bothersome, they will not leave you alone and will not take no for an answer. My arms are bruised where they tried to pull me into their shop to purchase items. It was not a pleasant experience. Some taxi drivers like to make sexual innuendo's. Do not travel alone it is not safe, always book you taxi through the hotel and ask the staff to make a note of the taxi no, also ask how much before you ride, they often overcharge! I would not recommend this hotel or area for a girlie holiday or for a family with teenagers or small children. It would be more suitable for couples or honeymooners. It is not an All inclusive Hotel as such, It’s more like full board with refreshment within a restricted time limit. The food was ok, but the same thing most days. I saw a few rooms in Nahrawess Hotel. Rooms were very dirty and damaged. Bathrooms were ruined! Halls were dirty and smelly. Lifts were old and scrathed. Hotel has nice garden, wide swimming-pool, good location - near sea and the city centre. Hall near reception look nice. But on the floors is a catastrophe: stink and dirt. Hotel staff are sleepy and slow. Maybe for tips they are litle faster. Restaurant is stuffy with fly. Entertainments were weak and litle boring but expensive (a tickets were sold before evening entertainments). There were no entertainments in the morning and afternoon. I have been staying at this hotal since it was first built in the 1990's. I have been there with my grandchildren and lately just myself and husband have been there. In all I have been in this excellent hotel 10 times and have always found all staff very attentive to your needs. The rooms are always cleaned very efficently. The Food is very good and always available on time. The staff in this area are excellent. My grandchildren when they went with us, enjoyed themselves very much, the pool area was very safe for youngsters and the beach was a very short distant from the hotel and very safe to approach. The new Thalassa Palace is a great addition, especially for the young at heart. I look forward to next year, when I will be attending again, hopefully many more times to come. I would recommend this hotel to both young and old as both myself and husband are OAP we find this area very relaxing, but it also appeals to youngster, there are plenty of sporting activities available on the beach also in the hotel. 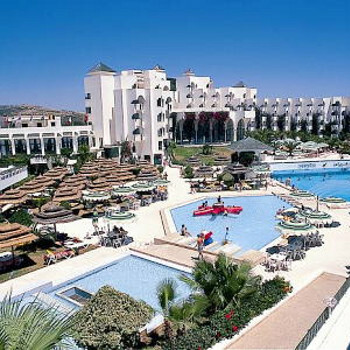 There is also a very good taxi service into Hammamet Town and it is very reasonable. Plenty of restaurants and shops nearby. We made a last minute booking and were delighted. The Narawess is a big,somewhat impersonal hotel, with an international clientele. However, I found the staff were generally friendly and helpful, and the standard of general maintenance and cleanliness excellent.